If your company is thinking about doing a business relocation in MA, CT or RI, it pays to hire professional relocation services to take care of all the logistical planning, packing, loading, unloading and setup at your destination location. The cost to hire a commercial moving company is negligible compared to the service and security that you get by going with a pro. Sure, you could have your staff members work on the weekend to pack and load and move your stuff, but there are so many benefits to hiring professional moving companies in Seekonk, Massachusetts to take care of this service for you. Two of the most important things in the business world are time and money. In many cases, time is money and money can mean that you have more time to do the things that you want to do. Wasting either one of these essential things can be stressful and can actually result in a loss for your business. Planning a move can be a real headache, but trying to coordinate everything that needs to happen in a corporate relocation can be even worse. Most moves are for good reasons, such as moving to a better location or a larger location due to success and an increase in business. However, some business moves may be due to a loss, as a necessity to downsize and reduce overhead. Whatever the reason, it is important to protect your assets and make sure that everything from the office furniture and employee cubicles to computers and copy machines get moved safely and securely from point A to point B.
Conlon Moving & Storage provides a wide range or professional relocation services for corporate customers, including high value or sensitive equipment. We have provided business relocation in MA, CT and RI for medical offices, information technology departments with computer server networks and other specialized equipment. Our team is highly trained to take care of over-sized and odd-shaped items, handling them with care and packaging to ensure they arrive safely at your destination. 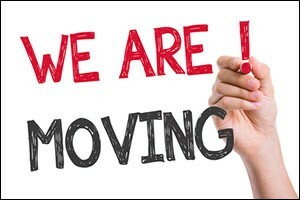 The definition of corporate relocation is “the movement of a company and its employees to a new location as part of normal operations.” The “new location” could be somewhere in the same city, county, state, region or country, but it could also be a relocation overseas. Business relocation in MA, CT and RI involves moving everything from the office, including all of the furniture, computers, file cabinets, important documents, printers, copy machines – whatever equipment is used to run the day-to-day operations of the business. In some situations, a commercial moving company is used to only take some of the furniture and equipment to a new location, as the company splits off into regional offices or a partnership breaks up. In other cases, separate branches could merge together to downsize and give the company a chance to grow before expanding again. There are many causes for corporate relocation, but the most successful commercial moves rely on professional relocation services to handle the details for best results. When you hire our team of highly trained and experienced movers, you can expect to get world-class customer service, competitive industry pricing, an on-time delivery rate of 99.9 percent and the absolute highest level of service excellence. We use specialized moving equipment, including lift-gate trucks and temperature controlled vehicles, allowing us to provide proper loading and transportation of your assets. Our team can provide inside pickup and delivery. We can also offer white glove experience setup for our customers who need computers, servers, furniture, cubicles and component furniture set up for them at the destination. Conlon Moving & Storage can also take care of minor installations, custom crating, uncrating and removal of debris after unpacking. We can schedule your move around your work schedule, providing professional relocation services on weekends or after hours to reduce down time. If your company is considering a business relocation in MA, CT or RI and you are moving locally, interstate or international, contact our moving companies in Seekonk, Massachusetts. We can provide you with commercial moving company services, mobile storage, long term traditional storage at our warehouse and a wide range of other professional relocation services. Give us a call at 508-336-7766 for a FREE estimate on any of our services or to speak with one of our representatives.